Guitar Lessons San Rafael provides you with a dependable, qualified and experienced guitar teacher. Our resident guitar guru has over 25 years of teaching experience and is currently the head of a music and recording arts department at a high school in Marin. In addition, he took lessons directly from John Scofield, Paul Gilbert, John Patitucci, Jim Hall, Mike Stern, & Jody Fisher. “Drew is the best you will find. I have been playing guitar for about 17 years, and am self taught. I learned more in 6 months of lessons with Drew than I did in 17 years combined. The key with Drew is that he has a music degree and understands music theory. Anyone can look up a guitar tab solo online and play it….but Drew will teach you WHY you are playing those particular notes, and what scale/mode those notes belong to in context with a particular song. It is this knowledge that will help you really learn how to play guitar, and not just memorize tabs you can find online. In addition, Drew is just a cool young guy, and fun to hang with. You will look forward to your sessions with Drew. His prices are reasonable for what he gives you, and I highly recommend him to anyone who wants to really learn how to play guitar, and learn music theory in Chicago.” – Dean L.
“Best Guitar Lessons I’ve Had. Easily worth $100 an hour. If your looking for the best guitar teacher in Chicago, look no further. I took 5 lessons at Drew Krag Guitar Lessons Chicago and I can’t believe how far I’ve come. I was a self taught player when I came to drew, now, I feel like I understand music a lot more plus I feel confident soloing over just about anything. 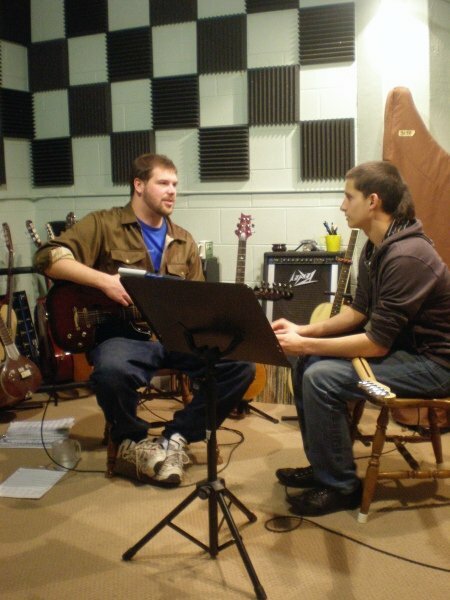 This guys no joke, if your serious about learning the guitar, Drew provided the best lessons I’ve had by a landslide.” – Wallace G.
“More than just a standard guitar lesson I took guitar lessons back in middle school and decided it would be good to get back into. Drew definitely provides a sense of comfort as I was somewhat embarrassed being 25 years old and taking guitar lessons. Drew’s guitar lessons go more in depth and help to improve technique and got me into other types of music such as blues. I believe Drew to be among the best instructors in Chicago and I would recommend his services to a player at any age or skill level.” – Kyle N.
This is a performance of Vivian Garcia and myself. She is a very accomplished flamenco guitar player and vocalist. I’m adding some color by soloing on a nylon string guitar. Many traditional flamenco players would frown on me for using a pick on a nylon string guitar, but I have only been studying flamenco for a year or two and comparatively, the pick sounds much nicer. Enjoy Vivian’s fine voice as well as her amazing flamenco technique. Note her right hand and how she picks the strings – very difficult stuff! Enjoy! Here is my most popular YouTube video. We are approaching close to 500,000 hits on this one! Keep your fingers crossed. This is a basic beginners guitar lesson on how to get your guitar in “relative” tuning. This means that it is in tune with itself and will sound good if your playing solo guitar. If your playing with other musicians, I highly recommend using a guitar tuner, or tuning to them by ear. Simple instruction, very important basic information. Enjoy! Here is a cool video guitar lesson where I show you how to create a blues chord solo idea. Chord solos can be difficult, but the sound that is achieved is well worth the effort it takes to get it down. The idea is creating a fuller sound by hitting multiple strings of the guitar. This is particularly successful when playing alone, but it still can be used while playing with other people as well. Enjoy! “Drew is the best you will find. I have been playing guitar for about 17 years, and am self taught. I learned more in 6 months with Drew than I did in 17 years combined. The key with Drew is that he has a music degree and understands music theory. Anyone can look up a guitar tab solo online and play it…. but Drew will teach you WHY you are playing those particular notes, and what scale/mode those notes belong to in context with a particular song. It is this knowledge that will help you really learn how to play guitar, and not just memorize tabs you can find online. In addition, Drew is just a cool young guy, and fun to hang with. You will look forward to your sessions with Drew. His prices are reasonable for what he gives you, and I highly recommend him to anyone who wants to really learn how to play guitar, and learn music theory.” – Dean L.
“I’ve been taking guitar lessons with Drew for a few months and am really impressed with him as an instructor. He is extremely passionate about guitar and obviously takes teaching it very seriously. Each new concept is presented in a clear and concise manner; but if you don’t get it, he’ll patiently explain it again until you do. Playing the guitar has never felt so approachable as it does after a few lessons with Drew. Whether you’re a novice or just looking to improve- you will definitely find these private lessons to be beneficial.” – Sara Q. “More than just a standard guitar lesson I took guitar lessons back in middle school and decided it would be good to get back into. Drew definitely provides a sense of comfort as I was somewhat embarrassed being 25 years old and taking guitar lessons. Drew’s guitar lessons go more in depth and help to improve technique and got me into other types of music such as blues. I believe Drew to be among the best instructors in California and I would recommend his services to a player at any age or skill level.” – Kyle N.
1. He is very good at explaining the concepts of what you’re learning. He starts from the basics and always explains why he’s teaching what he is. 2. He teaches enough theory for you to understand what’s going on without confusing you. 3. He writes great practice notes for you. 4. He is very congenial and easy to get along with. 5. He is passionate about teaching, and takes pride in being a good teacher. If you are thinking about learning guitar, I implore you to try Drew. I swear, you won’t be disappointed!” -Samantha W.
” I just finished my third guitar lesson with Drew. Over the last 3-4 years, I have bounced around to 4 or 5 different instructors, never coming close to finding the right fit. Frustrated, and in an attempt to self-teach myself, I also tried numerous teaching web sites and various software programs, before finally semi-retiring about a year ago. After deciding to give it another shot about a month ago, I researched various instructors in the Marin area, and found Drew mentioned favorably in multiple reviews, so I signed up for an introductory lesson. I can honestly say that after only 3 lessons, I already have a much better concept of what I am doing than all of my prior attempts combined. Previous instructors have said, ‘if you want to play this song, copy these chords or these notes” without any real explanation why. At least in my case, Drew seems to have found the right combination of useful practice exercises, the practical application of those lessons towards my goals, and enough music theory to help me better understand why I’m doing what I’m doing, without going over my head. Drew’s ability to teach guitar is rivaled only by his ability to play guitar, which is considerable. I would recommend him to anyone looking for first rate instruction.” – Adam L.
“I will preface this by saying I have only had one lesson with Drew, but I will be back and I am practicing because he knew how to teach me. This isn’t a b.s. advertisement or a friend of Drew’s. I actually took lessons with a different person. The lesson was bad and I ended up putting my guitar down. Drew was personable, professional and clearly understands how to teach a beginner how to play. His personalized lesson and practice instructions were great and I have no problem executing them. I can already tell I will be playing songs in no time. He is easily worth 100 a lesson.” -Drew N.
“Drew Krag is a complete master of the art of guitar playing. More importantly, he is able to communicate that extensive knowledge and skill as an instructor, whether the pupil is a beginner or a much more experienced player. His studio is conveniently located and he is always available on a flexible schedule. I highly recommend Drew for any person who wants to learn how to play guitar from one of the best.” – Jeff B. “Not only experienced but also an excellent teacher who helps you push the envelope so that you’re always getting better and better.” – Betty S.
” Drew got this long time beginner moving again – I’ve been “teaching” myself guitar for more years that I would care to admit. I never really understood what was printed in all the books I bought and also managed to develop pretty bad technique. It also didn’t help that I was moving around a bunch and never sat in the same city for more than a year. When I finally moved back to San Rafael, and settled down, i finally decided to take some guitar lessons from someone who taught better than I could learn. Drew is that teacher. I’ve been going to see Drew for about 3 months, and my improvement is audible. Even the fiancée is impressed with my progress! His teaching style is both positional and non-positional and he really takes the lessons to wherever you want them to go. No matter what the style, skill or age of student, I’m pretty confident that Drew can guide them to new levels and present them with awesome study material.” – Markian P.
“Great Teacher – Drew really knows his stuff, and approaches teaching things at a level comfortable for the student. I feel like I’ve progressed a lot in the short time I’ve been taking lessons and look forward to seeing how far I can go. He’s great at pushing me to do things I would not have approached otherwise.” – Joey N.
“excellent teacher I believe he would be a superb teacher for all levels of players and all styles. I certainly have enjoyed all my lessons with him and I have noticed my level of play and awareness for the guitar has increased. His style of teaching can be both inside and outside the box; he brings enthusiasm and love for music that is contagious. If I were rich I would hire him as my minstrel just so I can jam with him at beck and call. I would probably have Jim Gaffigan as my jester if I could also. But that aside, I give Drew my highest accolades.” – Douglas S.
“I took lessons with Drew for over six months before I moved to Colorado. He is by far the best guitar teacher I have ever taken lessons from. His concepts are fun, simple and well commutative and he has the patients of a saint. I started from scratch and after six months, I felt confident playing much more advanced material. Guitar is so much fun for me now! If I could only find a teacher as good as Drew in Denver, I’d be all set!” – Christine S.
“Very knowledgeable and patient–besides that he is a musician that has experience of doing live gigs—so besides the theory he has a “working” knowledge of what works and what doesnt—again his understanding of music is that of most jazz guitarists—excellent—he can teach whatever your into–jazz,blues,metal etc…he doesn’t have any weak areas in my opinion—he can give you the tools to whatever your music preference is—–easy to get along with—-does not have an ego problem like some instructors—-as i said before patient no pressure –move at your own pace—-the guys a class act!!!! !” – Steve R.
“Sick Lessons I took lessons from Drew for about 4 months. He is without a doubt a great ally to have when it comes to learning the guitar. His relaxed studio is very welcoming, and neat. Overall, his approach to teaching is great! I would advise all my friends to take lessons. Let’s just hope he still has time for an old client…” – Bradley B. “Drew is absolutely the best guitar teacher in Marin, I learned something new in every lesson – even the first lesson which was free! I finally feel comfortable soloing and playing music with other people:) Thanks a lot Drew!” – Mike M.
“Professional and Affordable! I was very impressed with Drew’s teaching style. He is very professional and doesn’t waste your time showing off like most guitar teachers do. He gives me great stuff to practice during the week and I sometimes bring a song that I’d like to learn and he breaks it down so easily. If you are considering guitar lessons in the San Rafael area, you will not be disappointed with Drew Krag…” – Kacey S.
“Great With Beginners! I knew nothing when I started guitar lessons with Drew, Its been a few months, and I have already tackled songs I never thought I would be able to play! I’m currently working on over the hills and far away by Zep! its very challenging, but I love to practice and learn more from Drew. He doesn’t only show you how to play the guitar, he helps you understand the inner workings of guitar and music theory in a simple easy to understand way!” -Diego D.
“Real Guitar Lessons – Drew doesn’t only know how to play, he knows how to teach. I learned more in one month taking from him then I did in two years studying on my own! he is the real deal.” -Keith C.
“I learned something new in every lesson – even the first lesson which was free! I finally feel comfortable soloing and playing music with other people:) Thanks a lot Drew!” -Henry W.
“The guitar lessons you gave were the best I ever had. The site is a good idea. Keep it up! Thanks.” – R.J.
“I came to Drew because I was stuck in a rut with my playing. After just a few months of lessons, I feel as if jazz is as familiar to me as holding a pick. And he’s a cool dude to jam with, too! Probably the best teacher for my money.” – Mike C.
This is beautiful. For all of you that don’t know, B.B. King is completely self taught. Its lovely to see him giving a lesson. This mans passion is intoxicating! If you have yet to see him play guitar live, I highly recommend it. This is a guitar lesson where B.B. discusses phrasing which is what he does best. B.B. can express more emotion with a single note, than most players can with a hundred notes! Enjoy! Slash is another self-taught genus. I have been a huge fan of Slash for as long as I can remember. Appetite For Destruction was the crowning of my manhood. I read a column Slash wrote for Guitar Player Magazine, and he was so modest for such a great player. In this video guitar lesson you can experience a bit of his personality and practicing techniques. Enjoy! This is hilarious. Ted (insert curse here) Nugent gives his whacked out version of a guitar lesson. Now you can see why they call him the motor city madman. Its true, he is just that way lol I couldn’t resist throwing this in here… I met the Nuge in the north woods of Michigan about ten years back… He came into a restaurant that I worked at and invited the whole place to his archery camp… I was terrified to go, but I more terrified to say no lol! He played a few songs for us and woo’d us with his wacky ramblings… enjoy… or be terrified lol ladies and gentlemen, the motor city madman! Here’s a guitar lesson by Kirk Hammett of Metallica. He goes through a few classic licks from the album Master of Puppets. I don’t think any guitar player could escape the intoxicating call of Metallica at one point or another. The black album captivated me as a a kid, so Kirk has always been a hero of mine. Most of his solo’s are tricky, but his rhythm parts are genus and many times not too difficult. In this video guitar lesson, he shows you a few of his classic licks. Enjoy! Dave Mustaine of Megadeath gives a basic Metal guitar lesson. He is a veteran of playing Metal guitar and its great to see him do an overview of Metal technique and alternate picking. Its tough to find lessons with talented players that can be simple and easy to comprehend. Cheers Dave, great job! Brian Setzer.. What more can I say. You may remember this guitar player from The Stray Cats, or as the ringleader of The Brian Setzer Orchestra. Known for his aggressive rockabilly chops and up tempo big band swing, he continues to impress in this guitar lesson. Amazing hollowbody guitar he is playing as well; I can only guess that is a custom Gretch guitar, as that is Brian’s primary brand. This isn’t so much a guitar lesson, as it is a testament of how great one can get with intense study. This is a great video lesson featuring the great Stevie Ray Vaughan. Enjoy seeing an amazing guitar player close up and personal. Listen to the quote in the very beginning about being less of a purist made Stevie the player he was… This video also covers how SRV was able to triumph over drugs, only to die in a helicopter crash:( So tragic. Berklee College of music costs far too much for any non-rich person to attend, so its kinda cool to find some free online lessons from them. I attended Berklee for about a week, its a very competitive environment, which might be good for some, but I found the place to be like a trendy high school for musicians. Everyone had their chin in the air and was “the best”… Didn’t seem worth the price, plus I was not impressed by any of the professors that I took lessons from. But none the less, this is a cool lesson, with some fairly simple guitar rhythm blues ideas. Enjoy! This isn’t as much of a guitar lesson as it is a revelation of how amazing someone can get after years and years of study. If you haven’t heard of Eric Johnson, you may want to sit down before watching this video. Eric is an anomaly. You will hear influences from Jimi Hendrix to Eddie Van Halen, but you may notice his overall tone and style is unlike anyone you’ve ever heard. He is perfect example of how far one individual can go with years of collective study. Enjoy! What can I say… Never give up! This guy is incredible… I just wonder how he tunes that thing! Here’s proof in case you needed it that you should never stop playing guitar, even if you loos your arms! Enjoy! This video is a little scary, but these kids are amazing guitar players! Check this out! These are so many ways to play the guitar. Here’s a great example. Andy Mckee has developed his own way of playing this instrument. Perhaps the best thing about the guitar, there are so many sounds and different ways to play this instrument! Its never wrong to experiment with this instrument – it can lead you into a new reality of guitar playing! Here is a collection of video guitar lessons I made for GuitarPlayerU.com. Where to begin… Lets start with the headstock – you may think this headstock may look a bit “fendery” to be on a Gibson, in fact, this headstock is from a Gibson Firebird which is one of my favorite Gibson designs of all time. The semi-hollow body is reminiscent of other 335 style guitars – its not to heavy but its all maple body is built like a tank. You may be surprised that Dave went with a semi-hollow body. As you may remember, Dave Grohl was the drummer for Nirvana, and I feel he is single handedly responsible for keeping rock alive. You’d think a solid body is more suitable for its high-gain application in the Foo Fighters, but believe me the semi-hollow body and burst-bucker pickups yield a thick yet sparkly tone that screams with distortion. Mill Valley, Corte Madera, Larkspur, Belvedere, Novato, Richmond, Tiburon, Sausalito, San Anselmo, Lucas Valley, Marinwood, Fairfax, Kentfield, and Ross.